Sitting beside your newly-driving 16 year old daughter as she backs out of a Costco parking space is not for the faint of heart. The kids running by, the impatiently waiting car with flashing lights, my mom in the passenger seat, instinctively pushing her foot on an imaginary brake – not the most relaxing day. The solution is to take frequent, stress-free breaks. Which is how we ended up at the farmer’s market. Hours later, we stand in the kitchen, looking at the 25 or so nearly over-ripe bananas on the counter. It was just too good to pass up: $1 for all the nearly-rotting bananas you could carry. Naturally, we grabbed as many as we could hold without a second thought. But now we have two dozen old bananas that need to be used right away. 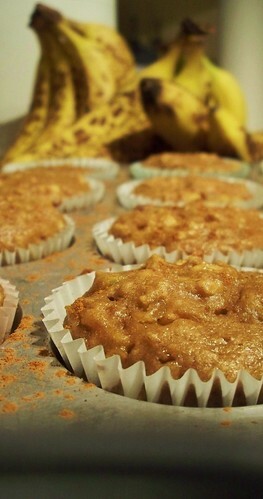 There couldn’t be a better excuse to make healthy banana apple muffins. There’s plenty of tasty banana things I like to make. Banana bread. Pound cake. Even cookies. But somehow I decided to try a healthy recipe. While they sound good on paper, healthy recipes don’t always translate. Like a sugar free cookbook I picked up from Goodwill filled with layer cakes and cookies sweetened naturally. Blech. My major complaint with healthy muffins is this: they only taste good fresh out of the oven. Wait a few days and they’re a little too moist. They don’t look appealing. These muffins didn’t last a few days, so it’ll remain a mystery. It does say something about this recipe though, which is adapted from allrecipes.com. Preheat the oven to 375 degrees. Grease or line 30 muffin tins with paper cups. In a large bowl, combine the applesauce and sugar, mixing until smooth. Stir in the two eggs, one at a time, mixing well between additions. Then mix in the vanilla extract and yogurt. Sift in the flours, baking soda, salt, and spices, gently mixing until barely combined. A few streaks of flour are fine. Carefully fold in the mashed banana, and diced apples. Use a small ice cream scoop or tablespoon to fill muffin tins 3/4 full to create raised, rounded tops. Bake muffins for 20 minutes, or until a toothpick inserted comes out clean. I wonder when we’ll get sick of bananas. Entry filed under: Breakfast/Brunch. Tags: apple, bananas, breakfast, healthy, muffins. I just made these muffins and they are SO good. I did do a few adjustments. I used FAGE yogurt at the recommendation of some other blogs ive read and added a large handful of golden raisins and I only used 1 1/2 apples. The recipe is missing a few things that you may want to include (baking soda, the spices) but I checked the allrecipes.com and figured it out. 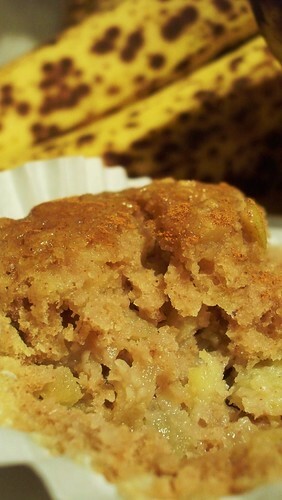 Its a great base for all sorts of healthy muffins so I’m excited to try it with more stuff. 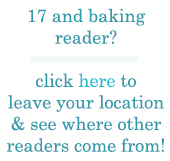 Love the blog, I’m in college and obsessed with cooking/baking so I have enjoyed reading yours!!! Calla – your adjustments sound like a huge improvement on the original! I’ll have to try them next time I make these muffins. wow….these look really yummy, i love baking but i have one question. do you use green or red apples?? Hi Maddi, it doesn’t matter which kind of apple you use – just whatever you’ve got on hand. Goodness these look so amazingly delicious! Cant wait to make this recipe. I am making these now. They smell fabulous and I’m sure they will taste great! The recipe is missing some ingredients though that are in the instruction part. i.e spices, salt, baking soda. It was a little confusing and I had to go to the original allrecipes recipe to figure it out. Might want to make the recipe uniform with the instructions. Other than that, awesome!!! The list of ingredients does not name chocolate chips, but the instructions say to fold them in. Do they go in the muffins, and, if so, how many? more smartly-favored than you may be right now. this topic, produced me for my part believe it from so many numerous angles. Its like men and women aren’t interested until it is one thing to do with Lady gaga! I made these muffins tonight, and although delicious; they stuck to the paper something fierce. Anyone else encountered this problem? And how did you fix it? & it helped me out a lot. I am hoping to offer one thing again and help others like you helped me. no one eose know such detailed about my trouble. Youu are wonderful! There were no measurements for soda or spices or the names of the spices used. Has anyone tried Splenda brown sugar? My hubbie is Type 2. Also, guess I’m out of touch, but what is FAGE yogurt?